Is it possible to introduce a microorganism to a colony of black mold that will kill off the black mold entirely and permanently? 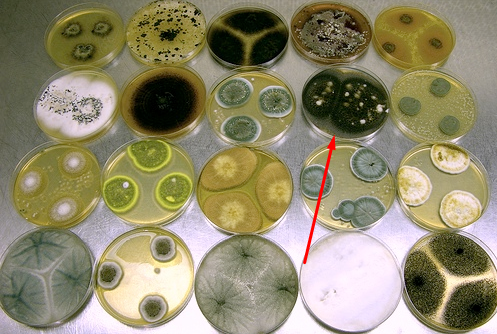 Is there a common microorganism that likes to eat them and is harmless to us? In other words, I ask if there's a way to get rid of the mold biologically, maybe a different mold that at least won't stink? Alternatively, will getting a UV lamp to shine in the opening once in a while be an optimal solution? I also read that copper sulfate is a popular fungicide with plantations, will it kill and prevent the mold from coming back? Could this ruin the AC with corrosion or be harmful to people if it will be airborne? I ask this because I have black mold in my AC and I can't take it apart and disinfect it. A weak vinegar solution (maybe 1:1 ratio water and vinegar) will solve your problem and will not stink up your home. Vinegar smell evaporates very quickly and are great for areas you can't reach easily to clean by hand. I promise your AC won't smell like egg salad. Not the answer you're looking for? Browse other questions tagged biochemistry microbiology mycology or ask your own question. Why is black eumelanin black even though it consists of black AND brown molecules?